To create a fully customised and personalised clothing experience, one of the services which we provide is our label and relabelling service. By removing and relabelling clothing, it provides your clothing with a fully personalised appearance which your customers will love. 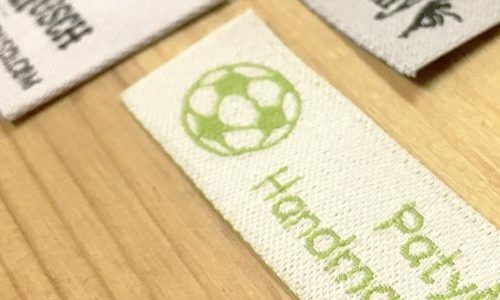 The simplest form of relabelling is removing the neck tag of an in-stock product and replacing this with a custom printed label either under the neck tape or sewn directly into the top of the tape. We can use the existing care label instructions that are including with the clothing as this displays sizing, country and also wash and care instructions and then include a separate label to advertise your company, company logo and information about your company. One of the more popular options for getting clothing fully relabelled is to use satin printed labels. These are usually white, polyester-based labels, which is then printed on with a maximum of four colours. This is a good option for small text which might not be visible if you use woven labels. It leaves a soft finish which reduces irritation on the back of the neck and is commonly found within the clothing of many high-street brands. Woven satin labels provide a more professional and sophisticated look from the inside out. Woven satin labels use a maximum of four colours, although we recommend using no more than two. Woven damask labels are similar to woven satin but the material used is ultra-soft to provide you with a more luxurious feel while also offering a higher definition finish. Woven damask is the perfect option if you’re considering using smaller text within your label. Woven damask labels can use up to four different colours but we recommend using no more than two to keep the weight and the bulk of the label down. Using our direct to garment machines, we can easily print labels directly onto the neck of the T-Shirt. Direct to garment is a fantastic option for white garments and also for logos which don’t include small text. For DTG printed labels there is also no minimum order quantity. Our expert staff can cut out your labels to any size and then transfer these onto the garment with any colour background that you desire. Transfer printing is the perfect option for small order quantities and also for labels which feature intricate designs. If you have a specific brand requirement such as colour guidelines then screen printed labels are the perfect choice. This is because we can use Pantone colour matching to ensure that your brand is respected and the colours within your logo are matched perfectly. It produces a similar feeling to DTG printed labels and also provides excellent quality and definition when it’s printed. By law, all labels must include wash care instructions and the made-in information. Please bear this is mind when you’re designing your label artwork. If you’re thinking about relabelling or if you have any doubts about the labels that we can offer you, contact us.